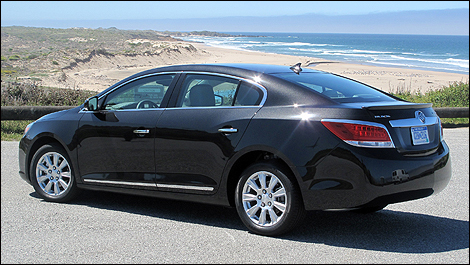 Buick is not calling the new 2012 LaCrosse eAssist a hybrid, even though it kind of is, because Buick doesn’t want to befuddle customers who have determined, in their own minds, that all hybrids must have certain attributes—like the ability to drive solely on electric power, or that a hybrid is dependent on a super-expensive, super-heavy battery, with an undetermined longevity record. US customers are more focused on fuel economy results, rather than the in and outs of the technology created to provide it. Net result: hybrid is out, eAssist is in. The LaCrosse eAssist has neither of those attributes, but it can offer substantial fuel efficiency. Buick marketing executives on hand at this LaCrosse eAssist launch, here in the heart of the Silicon Valley, noted that US customers are more focused on fuel economy results, rather than the in and outs of the technology created to provide it. Net result: hybrid is out, eAssist is in. Compared to a LaCrosse equipped with just the 2.4-litre Ecotec four-cylinder engine, the eAssist model will net you a 17-percent improvement in highway driving, and a 23-percent boost around town, which translates to city/highway ratings of 5.4 L/100 km and 8.3 L/100 km. But before we get to that, let’s quickly review the eAssist package (for the longer version, check out the article, GM to Take eAssist to Buick and Beyond). A 15-kW motor-generator sits where your alternator would usually sit, connected to the accessory drive belt. As usual, the crankshaft turns the accessory belt. 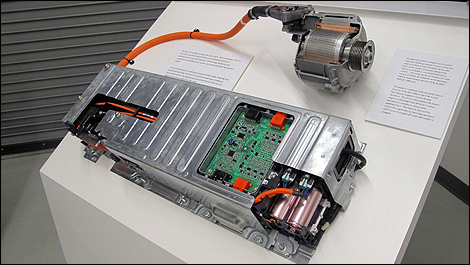 But in the eAssist scenario, the motor-generator can help “turn” the crankshaft (via that accessory belt) when it draws electrical juice from the trunk-located, 115V lithium-ion battery pack.